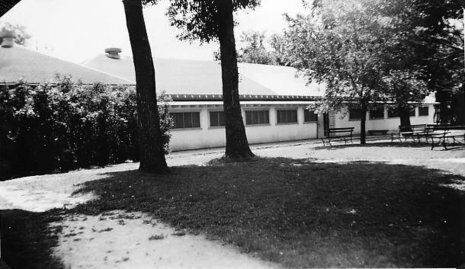 In 1917 the first Dell Rapids Pavilion was constructed in the beautiful city park and for the next thirty years it served the community well. It was the focal point for most major social events, including dances, roller skating, celebrations, reunions, receptions, and many other events. But in 1947 it burned to the ground and left a huge void in Dell Rapids. Local citizens quickly replaced the burned structure with a new and better pavilion that became even more popular. Up through the mid fifties people enjoyed the orchestra and big and era, but by the end of the decade the music started to change. Rock and Roll led by Elvis, was all the kids wanted to hear and soon those were the type of bands that packed the Dells Pavilion. National recording stars like Conway Twitty, Jerry Lee Lewis, The Everly Brothers, and Myron Lee played before capacity audiences. Many of the weekend crowds were standing room only. People came to Dell Rapids from all over Southeastern South Dakota as well as surrounding states. For many years the Dells Pavilion was one of the hottest night spots i the area but in the late sixties the ballrooms started to loose their popularity and began closing. In the seventies the Dells Pavilion turned into a manufacturing business and a few years later it was destroyed by fire. Anyone who attended dances in the sixties probably went to the Dells Pavilion at least a few times and left wit some great memories.